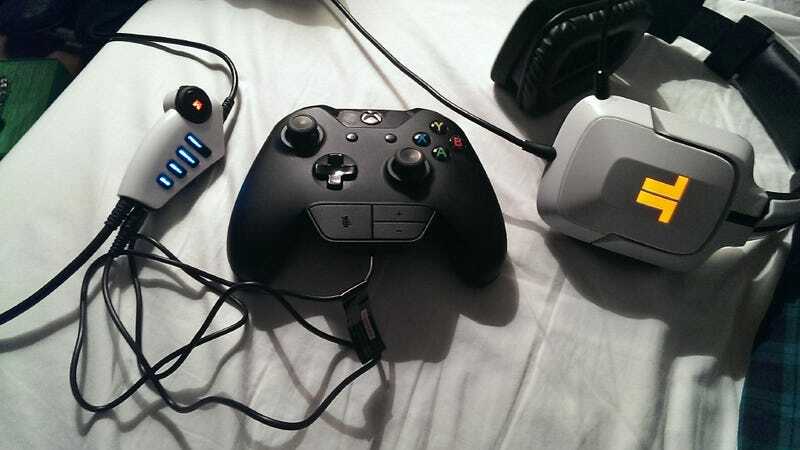 Third party headsets are unusable on the Xbox One until Microsoft releases an adapter, which won't be until next year. Your Trittons, your Turtle Beaches, your Astros and Afterglows, forget it. Except one audiophile, a guy with a soldering gun and a purpose, wouldn't let it go. Reader alsybub says he made his Xbox One compatible with his Tritton cans in about 15 minutes. "I simply opened up the headset connector, de-soldered the standard headset and soldered a 3.5 mm jack cable to the same points," he writes. "It looks like a product you might buy in a store, and it should work with any headset. "It took around 15 minutes to complete." We asked alsybub to show his work and he provided the following photo and description. "To open the casing you can literally just pull the back off. There's 5x Torx screws underneath, to open it. No warranty stickers or anything. "It's the four wires at the top right. With standard 3.5mm stereo wiring you solder, from left to right, Red, Ground, Green, Ground. The ground is shared by both connections (ie 3.5mm uses three wires 1x Red, 1x Green, 1x Ground) so I split it and covered them with heat shrink. "There is no loss in quality or volume," he says. "It's perfect." Moreover, "You could easily exchange this with a 2.5mm socket and use any 360 headset." Update: Another reader, David. N., did the same thing and provided this step-by-step on Instructables.com. If you hate using the disposable-quality chat headset included with the Xbox One, and have a soldering gun and a sense of adventure, maybe give it a shot? If you ruin it, you can always use the microphone on the Kinect sensor for chat audio while you wait for third-party support. Even if this mod is basic soldering 101 stuff, I'm impressed by alsybub's determination and unwillingness to take no for an answer. And if this swap is so easily made, I think it fairly asks Microsoft what consumer benefit is created by the Xbox One's different standard for audio devices.